I’ve always had a soft spot for Cyndi Lauper. I was intrigued that a year after it was released, “Girls Just Want to Have Fun” was still a top selection for Juárez strippers (or so I’ve been told). I dug the fact that she got pro-wrestling great Captain Lou Albano to play her dad in the video for that song. I thought it was cool that she got the title for her hit album She’s So Unusual from a song by Helen Kane (who many believe inspired the voice of Betty Boop) and that she sang, uncredited, the theme song of Pee-wee’s Playhouse in Kane’s Boopish style. And I’ve long forgiven her for the demon-haunted nightmares I endured for months after hearing her dance remix of “She Bop” on speakers bigger than my car in an Amarillo disco while in an enhanced state of consciousness. But beyond all that wacky stuff, Lauper has one amazing voice. I probably didn’t realize that until I saw her perform an incredible version of her hit “Time After Time” on TV back in the mid-1980s on a Patti LaBelle television special. Lauper starts off singing on top of a piano. But by the second verse LaBelle comes in to harmonize and embellish. The two play with the chorus, harmonize, shout the lyrics at each other, and end about five minutes later on a whisper. I saw this again on YouTube last week for the first time since it aired. It’s even better than I remembered. But I have to admit, I lost track of Cyndi Lauper. Every so often I heard about her latest attempted comeback, but I didn’t hear anything all that enticing. In fact I hadn’t sat down and listened to an entire Lauper album since her heyday. Just a few weeks ago she released a country album called Detour. 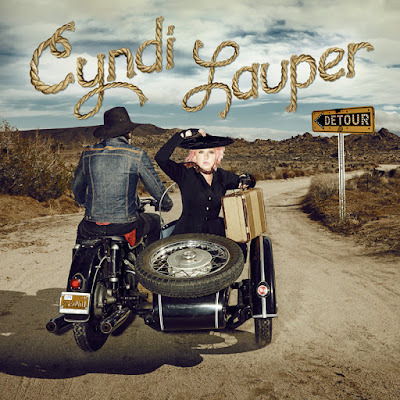 Yes, there’s our Cyndi Lauper in a prim, black, long-sleeved dress in a motorcycle sidecar, clutching her hat in one hand and an old suitcase in another. She looks like a 1880s schoolmarm heading out west where John Wayne and Jimmy Stewart can fight over her. And yes, this is real, steel-and-fiddle, hard-core-honky-tonk music with crackerjack Nashville cats and guest stars including Emmylou Harris, Vince Gill, Alison Krauss, and Willie Nelson. She romps through C & W chestnuts like “I Want to Be a Cowboy’s Sweetheart”; “Heartaches by the Number”; Conway Twitty and Loretta Lynn’s “You’re the Reason Our Kids Are Ugly” (sung here with Gill); and the Wanda Jackson hit “Funnel of Love” (though my favorite version of this song is the one Jackson recorded with The Cramps a few years ago). And, to her credit, Lauper doesn’t adopt any fake hick drawl. You still can hear the Noo Yawk in her. And even better is a little-known Marty Robbins song called “Begging to You.” If I had a beer, there would be a tear in it after this one. No, this isn’t essential country music, and it’s probably just a crazy little detour in her career. But it’s great to listen to Lauper again. Lauper is scheduled to perform in Albuquerque at the Sandia Resort and Casino Amphitheater on Sept. 17. 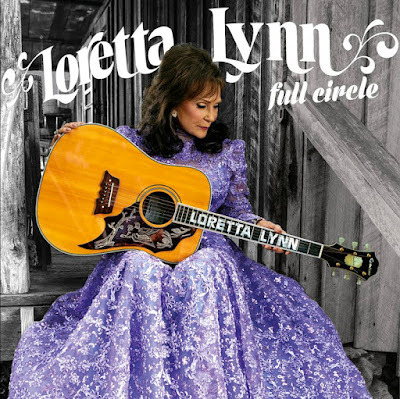 * Full Circle by Loretta Lynn. This album, Lynn’s first in a dozen years, is a bittersweet triumph. She’s in her early eighties now, and we’ve lost way too many country giants of her generation in recent years, most recently Merle Haggard. The good news: Her voice sounds as strong, clear, and spunky as ever. Could it be Pro Tools or some other studio trick? Who knows? I’m going to choose to believe not. If any of you cynics out there know anything different, do us all a favor and keep your yap shut. Speaking of modern studio tricks, unlike her previous album, the Jack White-produced Van Lear Rose, there’s little in the way of fancy recording wizardry on Full Circle. The producers — Lynn’s daughter Patsy Lynn Russell and Johnny Cash’s son John Carter Cash — wisely keep the emphasis on Lynn’s voice and the songs. And it’s a splendid selection of tunes. There are re-recordings of Loretta Lynn songs, including the proto-feminist “Fist City,” one of her late-’60s hits, and “Whispering Sea,” a country waltz that’s not one of her best-known numbers but is the first song she ever wrote. My favorite on this album is “Everything It Takes,” an “other woman” song that might have been a country hit 50 years ago, except Lynn wrote it fairly recently with Todd Snider. Elvis Costello sings harmonies. And here's Loretta recording "Whispering Sea."